Leary (DD-879) was laid down 11 August 1944 by Consolidated Steel Corp. Orange Tex. ; launched 20 January 1945; sponsored by Mrs. Theodore S. Wilkinson wife of Vice Adm. T. S. Wilkinson; and commissioned 7 May 1945 Comdr. Ernest G. Campbell in command. On 23 June 1945 Leary completed her shakedown off Guantanamo Bay and proceeded to Norfolk. Overhauled and converted to a radar picket destroyer she reported for duty with TF 69 the day before the Japanese accepted terms for surrender. After a period of training off the Maine coast she proceeded to New York and took part in a presidential review 27 October. Denied a part in the conquest of Japan Leary was destined to play a part in the occupation of the fallen empire. 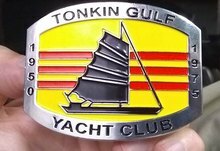 Sailing from New York 31 October she provisioned at Norfolk passed through the Panama Canal 11 to 13 November and arrived off Tokyo 19 December. For 2 months she cruised Japanese waters operating out of Kure before transferring operations to the Marianas and the Ryukyus. The slow voyage attbi.commenced at Tsingtai China 4 June 1946 with operations and stops en route. Leary moored at San Diego 21 December and early in January 1947 she again transited the Panama Canal and began East Coast operations first out of Norfolk and then Newport. Her first Mediterranean deployment began in October. Departing Newport 29 October Leary broke a busy operating schedule by visits to ports in Algeria Greece Italy and the island of Rhodes before returning home 14 February 1948. Such sights became commonplace in succeeding years. With the exception of 1957 Leary spent part of each year operating with the 6th Fleet. At times these cruises kind the stimulus of joint NATO operations or Near Eastern crises. She was in the Mediterranean during the Suez crisis of 1956 and the Lebanon landings of 1958 playing her part in the peacekeeping efforts of the 6th Fleet as she served as plane guard and on picket. From 22 October to 24 November 1962 Leary participated in the blockade of Cuba provoked by the Missile crisis as a part of America's determination to keep possible aggressors from mounting threats against free nations. From 6 to 27 August she served with TF 128 on a peacekeeping mission off Santo Domingo as American troops were landed to prevent political chaos and subversion. When not deployed in the Mediterranean or benefiting from yard work Leary might be found anywhere in the North Atlantic from the Arctic Circle to the Caribbean. During this period the characteristics of the ship changed with the removal of her radar tripod early in 1963 and a FRAM I overhaul April 1964 to January 1965. On 26 June she successfully completed her trials and qualifications with the new DASH weapons system. Leary returned to her home port Norfolk 16 December 1965 after completing extensive antisubmarine warfare exercises off the coast of North Carolina and Puerto Rico. 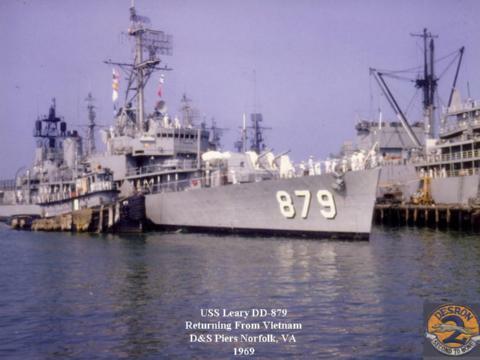 Following another month of operations and a month readying for deployment with the 6th Fleet Leary departed Norfolk 4 March 1966 for the Mediterranean With 5 months of operations and sightseeing behind her; she returned to her home port on 12 August for a month of leave and upkeep. The remainder of the year was spent conducting local exercises including an extensive evaluation of her DASH system. From 3 to 17 March she was Sonar School Ship at Key West Fla.
On 5 July 1967 Leary left Norfolk and headed via the Panama Canal for an extended deployment in the Far East. On this cruise she alternated duty with the carriers on Yankee Station with gunfire support off the Vietnamese coast. Arriving back at Norfolk 30 January 1968 the destroyer resumed Atlantic coast operations until entering the Philadelphia Naval Shipyard 14 June. In early September after her yard period Leary returned briefly to Norfolk before conducting training in the Caribbean through October and November. Operations off the east coast continued into 1969.